MANY moons ago, before Facebook and text messaging, I used to talk to people face to face, generally in pubs. When I was a young-ish pup my brother introduced me to gin with slices of cucumber in his village local. Most gin lovers there drank gin that way, so much so that the bar staff kept cucumber on a plate next to the lemons (the sliced ones that is, not the sad tipsy lads at the opposite corner of the bar). 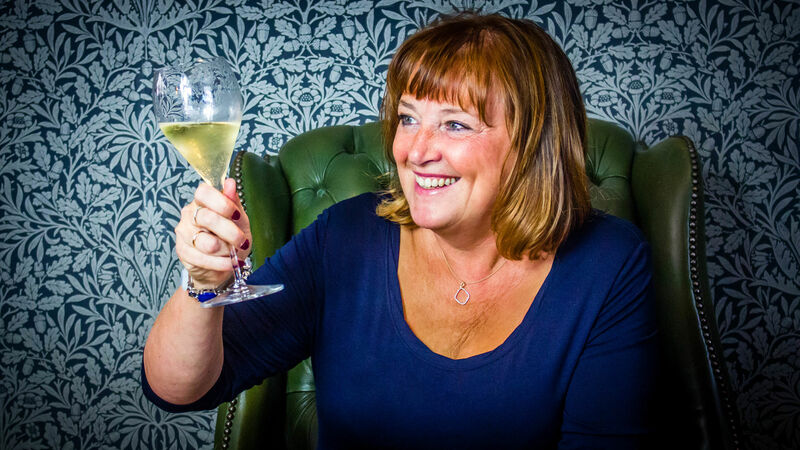 There was one bar staff wag who always asked “do you want salad with your gin?” How I laughed. I praise cucumber to my pals. Some try it, others look at me as if I’m suggesting eating a Jaffa Cake with baked beans. To mark National Cucumber Day and World Gin Day I‘ve tried gins with cucumber and tonic; as a shot (not my idea) and with elderflower cordial and soda. Why cucumber and not lemon? Lemon can be tart and cheek clenching; cucumber has spring-water green crisp freshness and is perfect on a warm sunny day. Or any day, with gin. Gin is a base white spirit, commonly made from grain, flavoured by botanicals. Some distillers use 10 or more botanicals. Juniper is dominant. My ingredients for this week’s Scientific Experiment have included Greenall’s The Original London Dry Gin (on promotion from £12 at Sainsbury until July 2, normal RRP is £15.49 for 70cl); Tanqueray London Gin (£21.70 in Tesco, 70cl but down to £18 until July 1st); Bombay Sapphire Distilled London Dry Gin (£20, Asda); Broker’s Gin (£18.95, Slurp.co.uk); Warner Edwards Harrington Dry Gin (RRP £33, independent merchants and direct from www.warneredwards.com) and Bottlegreen Elderflower Cordial (RRP £3.15, widely available). other gins. This was the basis of my first experiment and it nearly blew my head off. I managed to sip two gins. Broker’s is rich and full of flavour. It was interesting to sense the infusions within the gins; waves of fruit and herb gardens. Now my favourite bit; cucumbers. Three slices in each gin and a good glug of plain tonic water. 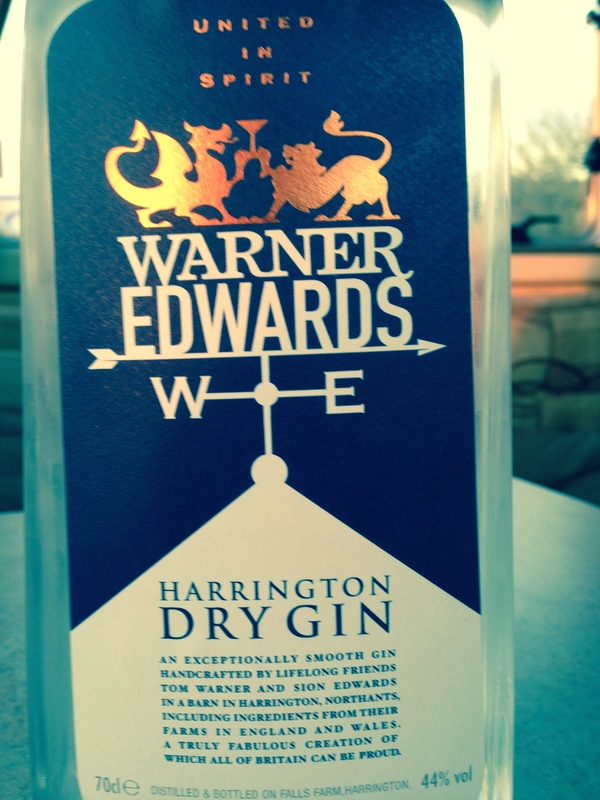 In April this year Warner Edwards Harrington Dry Gin won the top prize, a Double Gold Medal at the San Francisco World Spirit Awards. My word what a lovely gin. Botanicals include juniper, coriander, elderflower, angelica root, cinnamon, orange and lemon peel, and a “secret ingredient”. This was my winner. 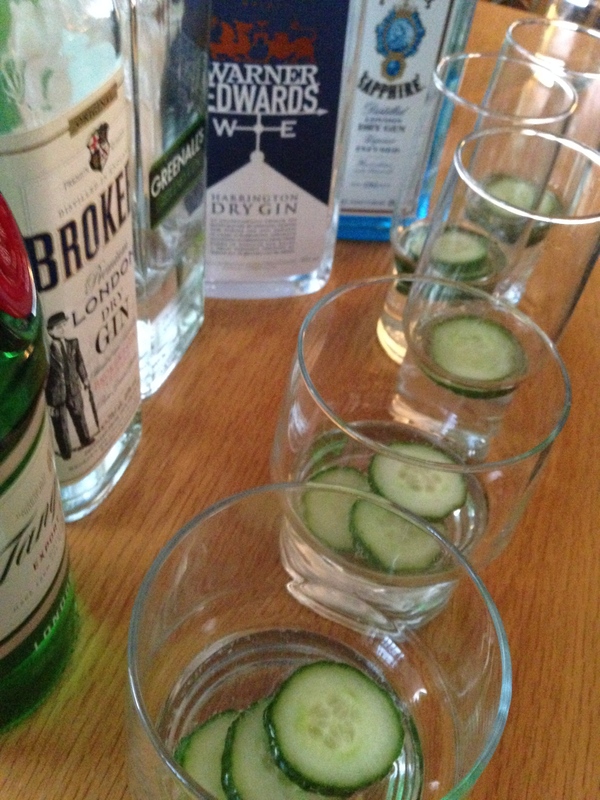 To taste with the cucumber, it was smooth, gentle, soft, herbal, light, fruity, a cushion of gin and cuddles of infused love. Look out for Warner’s limited edition Elderflower Infused Gin (from June 20, which sold out in eight weeks last year). 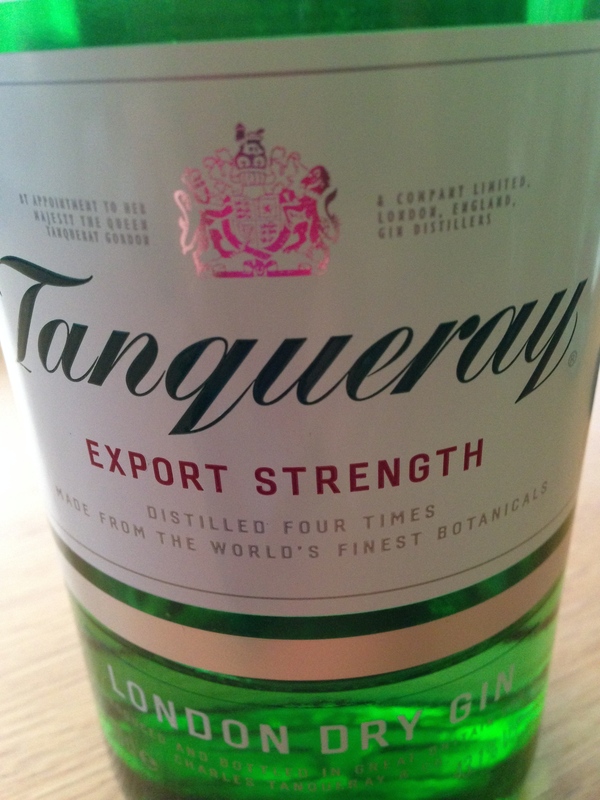 The Tanqueray was declared the winner by my Beloved. But the surprise of my mini-experiment was the elderflower cordial. 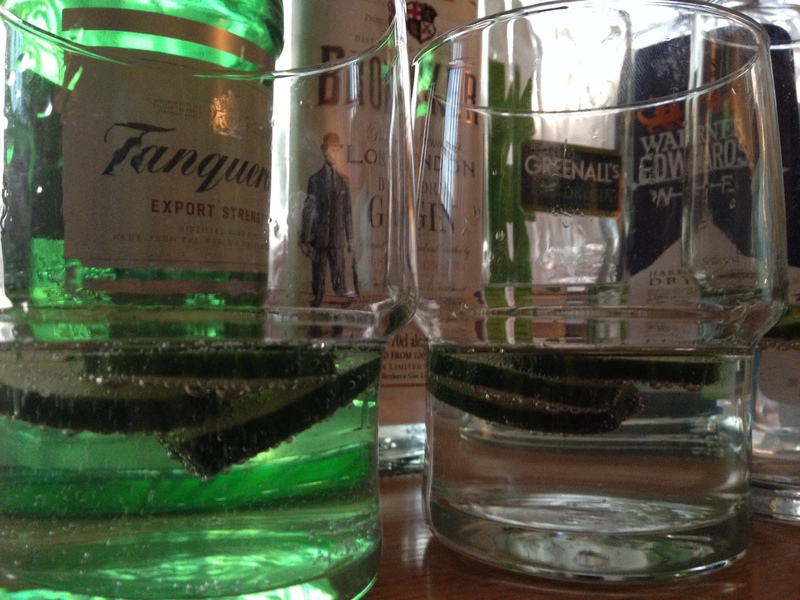 I combined a good glug of cordial and a decent measure of soda water and tumbled into the gins with cucumber. Every single gin sang with this. The Greenalls was bright and perfect; the Bombay Sapphire (which is always lovely in every way to me) was sublime. I have found myself a new cucumber chum; elderflower. Now go forth and experiment.